The new SimCity, set for release on PC early next year, looks delightful. It doesn't look like it plays all that differently than the old ones, just updated, as they might say, for modern times. What's exciting about this new Sim City is how alive it feels, how much it makes the earliest games in the series feel as static as board games. This one feels alive. 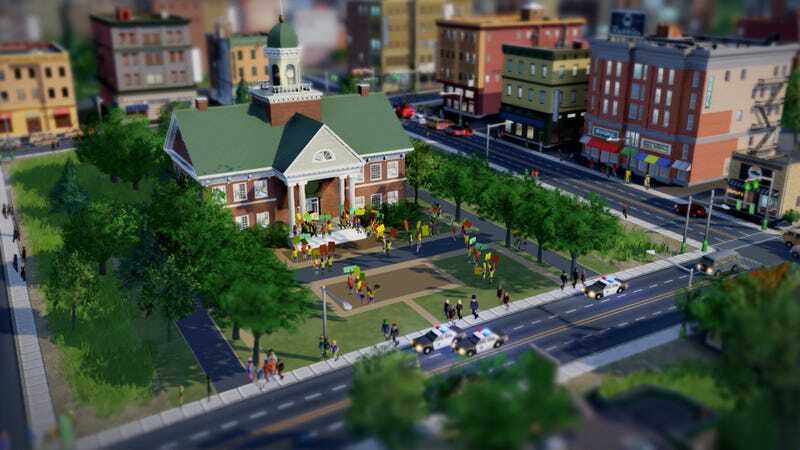 Developers on the game recently gave me a brief demo of their new SimCity, crafting a simple city to show some of the finer elements of their PC-only revival. They drew their roads, which now can be curvy. They did not terraform (there's no re-shaping of land in this game). They zoned the land between the roads, and as houses popped, moving vans pulled in. All of the traffic in the game is simulated, they pointed out. Every house has at least one Sim in it who has a job and goes to work. Each house emits some light, as do car headlights, turning the night-time part of the game into a spectacle of darkened hues and glowing lights. I saw citizen unrest in the form of people picketing at city hall. I saw crime as a van pulled up to a building and an arsonist jumped out, ran in and set a fire (we could hear the splashing of fuel, then the lighting of a match). Sims ran out in panic, some of them ablaze. The new SimCity was announced in March with the angle that it will explore the environmental and economic consequences of cities operating under different policies but joined by their co-existence on the same Earth. This was why publisher EA trotted out the director of the Al Gore environment documentary, An Inconvenient Truth back then instead of just showing some gameplay. But what seemed like it could be a dour game of harmful consequences then now seems to just as likely be a sunny game of bright reds and blues, populated with pleasing caricatures of urban life. This new city, after all, can also have its own super-hero and its own super-villain. At E3 its developers will show multiplayer, which will presumably demonstrate how one player's handling of their city will affect the cities of those with whom he or she is connected online. I haven't seen that yet. I've seen a Sim City that seemed alive on its own, not in any way radically different from the games that inspired it, just brought up to date with modern tech and a welcome willingness to still be a bit silly. SimCity is set for a February 2013 release on PC.